Indonesia - BOGOR, Indonesia 30 July, 2013)_Last month’s fires on the Indonesian island of Sumatra made news headlines worldwide as they generated record-breaking air-pollution levels over neighboring Singapore and Malaysia. Singapore’s Pollutants Standards Index (PSI) rose to an all-time high of 371 on 21 June 2013, surpassing the official “hazardous designation” of 301 or higher. Analyses by the World Resources Institute (WRI), Eyes on the Forest, and the World Agroforestry Centre of available concession maps from official national and provincial government offices, superimposed on daily fire alerts from NASA, showed that the bulk of fire alerts occurred on lands leased out to plantation companies for the development of large industrial oil palm and acacia plantations. There are two caveats to these analyses: NASA’s fire alerts do not indicate the shape and size of the area burned, so it is difficult to accurately determine the use of the land from these data. More importantly, however, is that if the available maps of industrial concession boundaries for oil palm and pulpwood (acacia) plantations are different from the boundary maps held by companies, the analyses can be wrong — and many companies are arguing precisely this (see WRI’s blog here). 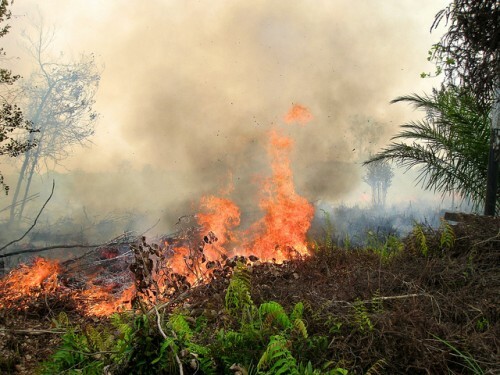 Therefore, when the ministers of Indonesia, Malaysia, Singapore, Thailand and Brunei met on 17 July to find solutions to the recent haze problem, they stressed the need for Indonesia to provide detailed maps of land use and fire-affected areas. Map not displaying correctly? View it in a new window. While it might take time for detailed land-use maps to be released, here we show that it is possible to produce detailed maps of land use showing the effective area of industrial plantations and detailed fire-affected areas, using before-and-after-fire images from NASA’s recently launched LANDSAT 8 satellite. Only 4% of the burned area was covered in natural forest before the fires (Finding 4). To define the boundaries of existing industrial oil palm and acacia plantations, we analyzed the spatial arrangements of land parcels clearly visible on the pre-fire LANDSAT satellite imagery (25 June 2013, 22 April 2013). We digitized the grid-like spatial arrangements of land parcels, which have the same rectangular shape, size and direction — characterizing established industrial plantations of oil palm and acacia in the flat peat lowlands of Riau Province, the region that was worst affected by fires. We assigned each grid to either oil palm or acacia using spectral information from the satellite imagery. We also identified clusters of land parcels of varying shape, size, and direction, this being characteristic of small- and medium-land holders. A snapshot over the 24 May 2013 LANDSAT scene (127059) in 1:70,000 scale. The grid-like land parcels system where the shape, size and orientation of the parcels are all the same is clearly visible. This spatial arrangement characterizes established industrial plantations owned by companies. Clusters of land parcels of varying shapes, size and orientation are also visible, this being characteristic of small- and medium-holders. CIFOR’s newly released “burned area” map reveals that about 140,000 ha were burned during the 17-25 June fire event in one LANDSAT scene (Path/Row:127/059) covering an area of 3.5 million ha (i.e. ; 7.5 percent of Sumatra); this scene being the worst affected by the fires (64% of Sumatra’s fire alerts in June occurred in this scene), near the cities of Dumai and Duri. This burned area is higher than our preliminary analysis because we are now able to identify fires that were previously hidden by clouds. The spatial distribution of the burned areas was strongly correlated with the location of NASA’s daily fire alerts for the month of June. The spatial distribution of the areas that burned (in red) during 17-25 June 2013, under LANDSAT scene 127059 (3.5 million ha; i.e. 7.5% of Sumatra’s landmass, and where 64% of Sumatra’s fire alerts for June were recorded) in Panel A; and the distribution of NASA’s fire alerts (black circles) in Panel B. The spatial distribution of those fire scars was highly correlated with NASA’s point alerts. Our burnt areas are overlaid on a land-use map derived from LANDSAT 8, where yellow reveals industrial oil palm plantations, light green is industrial acacia plantations, dark green is natural forest, and gray is land believed to be primarily controlled by small and mid-level actors. Based on our LANDSAT-derived land-use map, we were able to calculate the area of each type of land use affected by the fires. These data show that while the bulk of fires occurred outside the grid-like plantations characteristic of industrial oil palm and acacia plantations (79%), a significant proportion occurred inside industrial oil palm and acacia plantations (21%). We found large differences between our LANDSAT-based land-use map and the publicly available maps of industrial concessions. 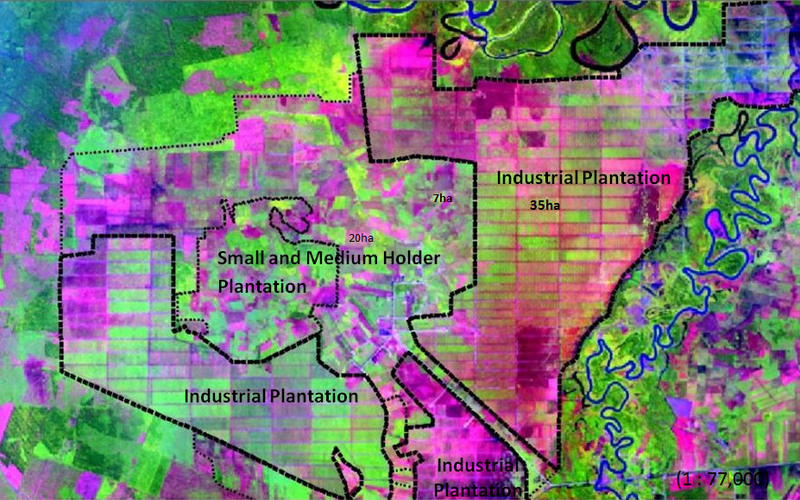 Many industrial plantations exist on the LANDSAT imagery where there are no concessions on government maps, and vice versa. Panel A: Land-use map generated using pre-fire LANDSAT 8 imagery where yellow and light green areas are grid-like plantation systems of oil palm and acacia, respectively, characteristic of companies; and where gray areas are regions dominated by land parcels of varying shapes, size, and orientation, characteristic of small- and mid-level actors. Panel B: Maps of oil palm (yellow) and acacia (light green) concessions held by companies according to national and provincial government land-use maps. Dark green areas are remaining natural forests, black areas are main cities, and dark blue areas are oil and gas zones. Our analysis of vegetation cover before the fire (soon to be published) reveals that only 4% of the burned area (140,000 ha) was covered in natural forest two months before the fire, although half this area was natural forest in 2008, and was therefore deforested recently. Vegetation cover pre-fire was dominated by low vegetation and exposed soils. A detailed and validated pre-fire vegetation map is under preparation. It does not seem to make business sense for companies to use fire in their plantations; many oil palm companies have committed to a “no burning” policy — aligning with sustainability standards such as the Roundtable on Sustainable Palm Oil (RSPO), the International Sustainability & Carbon Certification (ISCC), and the Indonesia Sustainable Palm Oil (ISPO) — while carbonized wood in acacia plantations is a contaminant in the pulp-making process, according to Neil Franklin of Daemeter Consulting, an Indonesia-based environmental consulting firm. However, sometimes companies need to clear land, and burning may still represent the cheapest way to clear this land. Field investigations will be required to understand why fires also occurred inside industrial plantations. Did plantation managers use fire as part of their management strategy to reduce costs of land clearing? Did fires start outside industrial plantations in small and medium plantations, but escape into the larger plantations? Did fires in industrial plantations indicate conflicts with small and mid-level actors? The list of questions is long. Above all, last month’s fires caught everyone by surprise: No one had predicted them. Detailed investigations are required to determine what triggered this abnormal increase in fire activity in June, compared with historical trends. The information provided in this blog is intended to assist response teams in their assessments of fire impacts on the ground, and to inform journalists, decision makers and the general public with objective scientific views. All the information provided in this blog is still research in progress, and a scientific publication will follow. The research forms part of the CGIAR Research Program on Forests, Trees and Agroforestry. For more information on the issues discussed in this article, please contact David Gaveau (d.gaveau@cgiar.org) and Agus Salim (a.salim@cgiar.org). Great article, thanks a lot. Very useful analysis. 2. If so can the field investigations also look into the anomaly that industrial plantations exist where government records show they should not exist. 3. Why has 2 above occurred? Does this mean the plantations are illegal or is it just that record keeping is not good enough? Congratulations on a very informative blog. It is refreshing to read something rational about the June fires rather than some political statements! Why does it not make business sense to use fire? Many companies have said it is the cheapest method of land clearing. I don’t think many companies are going for certification, not that that would stop them using fire. Could you tell me how to cite your article?